This interdisciplinary symposium will explore a range of issues pertaining to the social, cultural, and legal contexts around organ transplantation and ageing, particularly in South Africa. Panels have been arranged around themes including ‘Law and the Lab,’ ‘Ageing and Dying,’ and 'Organs: Sacrifice, Giving and Receiving.' Participants include historians, medical doctors, sociologists, and anatomists. 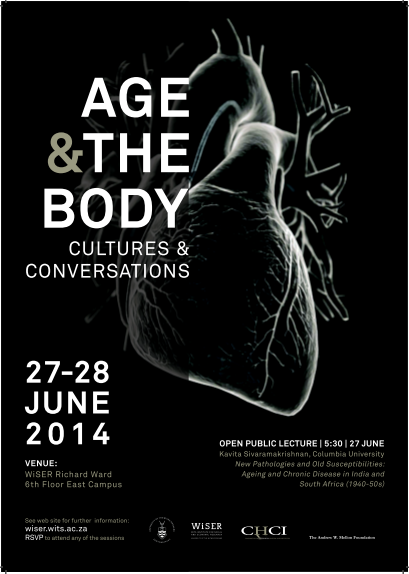 The keynote, ‘New pathologies and old susceptibilities: Aging and chronic disease in India and South Africa (1940 – 50s)’ will be delivered by Kavita Sivaramakrishnan of the Mailman School of Public Health at Columbia University on 27 June at 17:30. This event is opent to the public. VENUE: WiSER Seminar Room, 6th Floor, Richard Ward Building, East Campus, Wits University. To attend the keynote or the workshop, RSVP Thea de Gruchy: theadegruchy@gmail.com or 082 923 6853. Crip bodies enfleshing post-apartheid sovereignty? Assistant Professor of Sociomedical Sciences, Mailman School of Public Health, Columbia University. Age: A useful category of historical analysis?